I'm happy to share a short Q&A with Linwood Barclay in support of FaceOff! 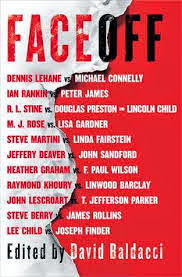 In case you don't know about FaceOff, it's an eleven-story anthology curated by the International Thriller Writers. But just when you think you know what happens, Faceoff will keep you guessing throughout these eleven electrifying stories. FaceOff is star-studded and is sure to be a fan favorite. All the famous thriller characters face off against each other! What was it like collaborating with Raymond Khoury on Pit Stop? Collaborating on a story was a new experience for me. Generally speaking, it's akin to a high-wire or trapeze act, except if it it goes wrong, you won't plunge to your death, which is a bonus. You write a chapter, and email it away, like sending off that horizontal bar to a partner on the other side of the stage, sixty feet in the air. They may catch it, but when they send it back, will you be able to grab it? The suspense comes in the waiting, wondering what your co-writer will do, where he will send the story. Why is Glen Garber a good pairing for Sean Reilly? My Glen Garber character, and Raymond's Sean Reilly were a good pairing. They're actually very much alike. Strong-willed, tough, pragmatic, but not immune to emotion. But Reilly, as an FBI agent, is the pro, and Garber, a guy who builds houses, is the amateur. Plus, he's got something very personal at stake in the story -- his daughter -- that Reilly does not. So they're going to clash at that level. I think it's possible, after the end of this story, that they could have become friends. At the very least, they'd go for a beer. Can you tell us about the single line you emailed to Raymond that ignited the idea for this tale? The line is: "Glen Garber had been given his coffee, but was still waiting for an order of chicken nuggets for his daughter, Kelly, when a woman raced into the restaurant screaming that some guy was on fire in the parking lot." Where did it come from? Who knows. But I knew the story was going to involve Glen and his daughter, a couple of very ordinary people. And I knew they were going to get caught up in an extraordinary situation. I wanted a sentence that would combine those elements. The mundane (waiting in line for fast food) bumping up against the horrific (a man set ablaze). The line just happened. I wrote a few more hundred words, then sent it off to Raymond, who ramped up the mayhem in the next installment. And then we were off.